Should the Eagles Let David Akers Go? Eagles long-time kicker David Akers has been in the headlines recently after his two missed field goals in the Wild Card game came back to haunt the team. Andy Reid made some critical comments following the game about the kicker. “We can all count,” Reid said. “Those points would have helped.” But then later we learned that Akers' six-year-old daughter was diagnosed with a malignant tumor only days before the playoffs began. Akers' contract is up, and some in the national media have suggested that this may be the end of his tenure in Philadelphia - especially after these recent events. At 36-years-old and after those two missed field goals, could it be time to say goodbye to Akers? 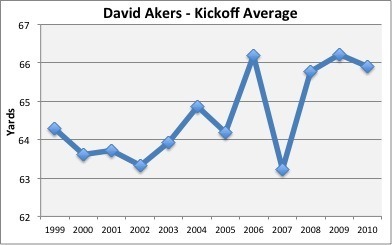 After factoring out onside kicks, it's easy to see that in 2010, Akers has shown as much leg strength as ever. In fact, four out of the last five years have been his most productive. Again, even at 36, Akers is doing better than ever. He had his highest touchback percentage of his career in 2010. Turns out Akers' great 2010 doesn't look quite as good in comparison to the rest of the league. He's only average in kickoff distance although he's in the top ten in touchbacks. Still, there's no evidence that his leg strength is slipping, and unless the Eagles are sure they can pick up an elite kicker to replace him, there doesn't seem too much reason to let Akers walk in free agency. Check back soon and we'll take a similar look at Akers' field goal percentages to see where they measure up.